Hi everybody! Today I have a short and simple – but fun – video recipe for doenjangbanga. 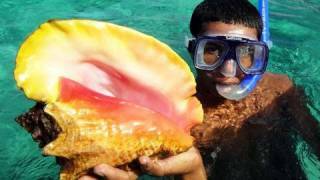 When I was in the island of Roatan in Honduras, I chartered a boat and a few men for snorkeling and fishing. We started at about 11:00 am and came back about 4:00 pm. It was an awesome experience for me and I was happy to film this video so that I can share it with my readers. As you can see in the video, I didn’t have a proper knife to fillet the fish, or a spoon to mix the dipping sauce! No kitchen tools! I used the flat bench on the boat as my cutting board. To be honest I didn’t expect that they would catch any fish. After negotiating the charter I quickly put some Korean ingredients and a plastic bowl into a plastic bag, and rushed on board the boat. 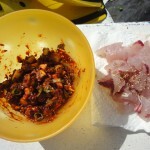 I was thrilled when I saw they caught snapper, lobsters, and a huge conch! I was so excited that I told them I would give them a $40 tip! Ow ow ow, then what happened? The captain Ronin immediately went to work to break open the conch so we could eat it! When I was young, my father used to charter a fishing boat when he visited his hometown island of Namhae. He always asked me to follow him on his excursion and told me he would make delicious hoe (raw fish) on the boat. Even though I loved the idea of following him, I always refused because I have a problem with seasickness. I knew I wouldn’t be able to enjoy a trip in a bumpy small boat. My father came home with lots of fish he caught and he would fillet them for us. I took a pill for motion sickness before going on this trip. No problem! OMG it was so fun! My late father would be proud of me if he saw me what I did! This dipping sauce’s main ingredient is soy bean paste. Dipping sauce recipes for raw fish depend on what kind of fish you have. This sauce goes well with snapper, flounder, or permit. I had never known conch has eyes! eepy! *tip: If you want some vegetables to wrap the fish in, prepare lettuce, perilla leaves, and green chili pepper. Put a piece of raw fish into the lettuce or perilla leaf, add some dipping sauce and a green chili pepper, wrap it and eat. Posted on Sunday, December 19th, 2010 at 12:43 pm. Last updated on August 7, 2017. Posted December 3rd, 2011 at 2:29 pm | Log in to reply. Maangchi, I love your glasses that you wore in this video!! Posted December 6th, 2011 at 12:44 am | Log in to reply. Thank you very much! I should wear them more often. Posted February 25th, 2011 at 12:36 pm | Log in to reply. Posted January 4th, 2011 at 10:03 pm | Log in to reply. I just came across your website and so glad I did!! I’m a Korean food lover and have enjoyed cooking it in my home for my own blog. Will definitely be coming back for recipes and ideas. Fabulous, fabulous– keep it up! Posted January 5th, 2011 at 5:19 pm | Log in to reply. Posted January 4th, 2011 at 1:33 am | Log in to reply. This looks delicious and I can’t wait to try it. I have miso on hand- can this be substituted for the Korean soybean paste? Posted January 4th, 2011 at 1:14 pm | Log in to reply. Posted December 22nd, 2010 at 6:10 pm | Log in to reply. Posted January 4th, 2011 at 1:15 pm | Log in to reply. Posted December 22nd, 2010 at 4:17 am | Log in to reply. Girlfriend…. if you were stranded on Mars … you would be there cooking Korean food for Martians! Nothing stops you! You find a way to feed your friends!! It made me hungry …. and I don’t like raw fish!!! Posted December 20th, 2010 at 10:23 pm | Log in to reply. I have everything I need………….except for the raw fish. Posted December 21st, 2010 at 10:20 pm | Log in to reply. Posted December 20th, 2010 at 9:06 am | Log in to reply. Posted December 21st, 2010 at 10:21 pm | Log in to reply. It sounds like you love raw fish. Posted December 20th, 2010 at 12:55 am | Log in to reply. This looks like so much fun. Fresh seafood & enjoying your time out at sea. I need to go one day. Posted December 21st, 2010 at 10:22 pm | Log in to reply. Posted December 19th, 2010 at 8:04 pm | Log in to reply. You are using food to promote diplomacy and world peace! Everyone understands delicious food. Thank-you for sharing the video and your story of your father – I’m sure he is proud to see what you continue to accomplish. Posted December 19th, 2010 at 10:19 pm | Log in to reply. “I’m sure he is proud to see what you continue to accomplish.” yes, I wish my father were alive and read your comment. Thank you! Posted December 19th, 2010 at 7:03 pm | Log in to reply. Your spreading the word about Korean food everywhere! Posted December 19th, 2010 at 10:17 pm | Log in to reply. Posted December 19th, 2010 at 6:40 pm | Log in to reply. ¡Qué bueno! That video brought such a big smile to my face! Food is the best way to share cultures. I’m sure your father would be very proud of you too. Were you speaking some Spanish? I hope to hear more about your trip to Honduras. yes, I will post my blogs about what I ate, what I saw in Honduras soon. Posted December 19th, 2010 at 4:15 pm | Log in to reply. You are fabulous! You make beautiful food where ever you go. It looked so fun on that boat and I was jealous because I get sooo seasick! But now I know you do too. ha!ha! I have never tasted fish that fresh- one day I hope I can. I’m glad you had fun and thanks for posting!! Posted December 19th, 2010 at 10:14 pm | Log in to reply. Posted December 19th, 2010 at 1:53 pm | Log in to reply. Posted December 19th, 2010 at 10:12 pm | Log in to reply. Brigitte, oh I didn’t know you like raw fish. Posted December 19th, 2010 at 1:26 pm | Log in to reply. : ) eww! I tried to avoid looking at them. Posted December 20th, 2010 at 10:24 pm | Log in to reply. Conch eyes, I never knew either, Kinda creepy! Posted December 21st, 2010 at 10:19 pm | Log in to reply. This recipe was originally posted on December 19, 2010 at 12:43 pm by Maangchi. It was last updated on August 7, 2017. The video was watched 84,778 times on YouTube & has 928 likes!